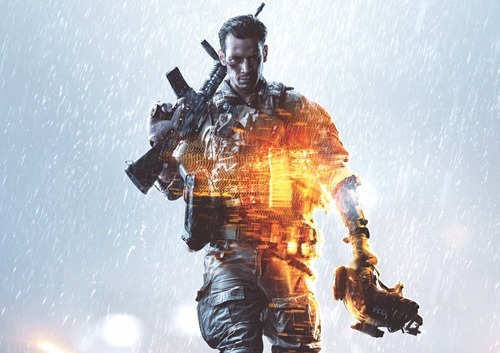 Here is a chance to get Battlefield 4 Premium Package worth $39.99 for Free. All five expansion packs (China Rising, Second Assault, Naval Strike, Dragon's Teeth, Final Stand). 12 bonus Battle packs. Lock n’ load with rare weapons, gun attachments, XP boosts and customizations only available to Premium members. Remember to get these contents you need to have Battlefield 4. The premium package is just add additional contents to the base game. 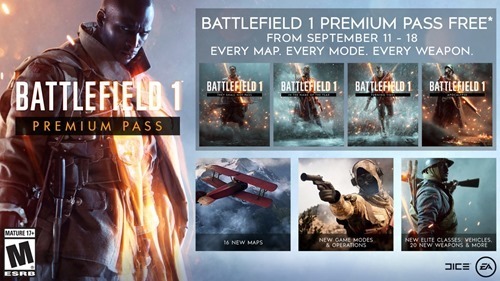 If you have Battlefield 1 and want to get Battlefield 1 Premium Pass from September 11 , 2018 to September 20, 2018 EA.com is giving away it for FREE. 4 expansion packs (They Shall Not Pass, In the Name of the Tsar, Turning Tides, Apocalypse) that is, access to 16 multiplayer maps, new Operations and game modes, powerful Elite classes, and more. 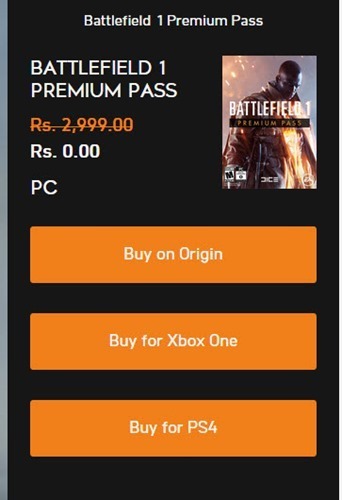 Remember you need to have Battlefield 1, so that you can get these offers. The game can be bought now from origin for just 312.37, that is 88% discount from the actual price.